It is always amazing to create a festive look of your home! It just doubles up the significance of that upcoming festival and shows that how deeply you are linked with the event about to reach! Looking for some amazing decors to give your home interior and instant decorative vibe? 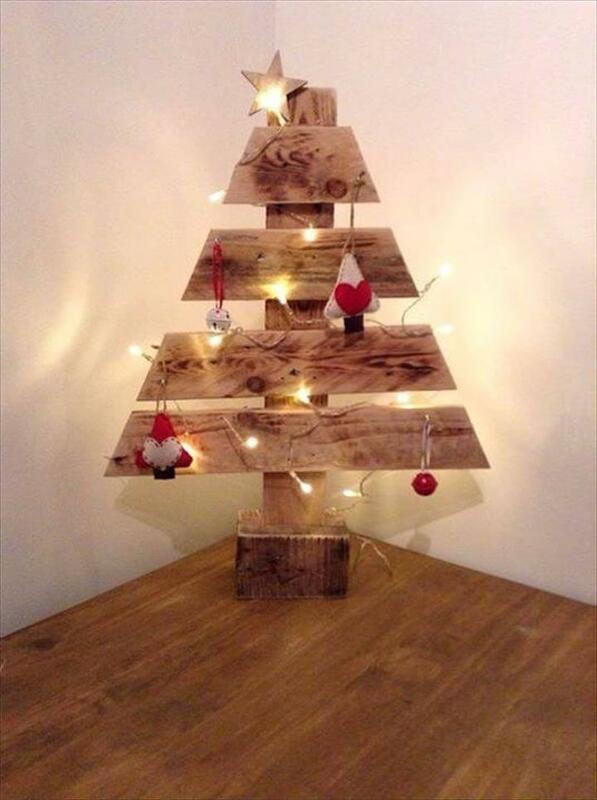 Then just join the pallet wood community and get some amazing plans to lift up the mood of your home to festive! Let your home catch a magnificent look with these DIY wood pallet trees, a beautiful collection of festival tree decors and have pure pallet wood composition! Each tree has a unique identity and has a different look and you can add different trinkets, baubles and other knickknacks to create a most personal look of these trees! These tree also versatile in use as you can hang them on any wall area, can add flat base to them for individual dignified standing and can also fix them in soft garden soil across the boundary lines! The first thing you can decide to create a personal appearance of the tree is the paint! Numerous different paint shades can be selected to boost up the fun of these wooden tree decors like white, green and red! 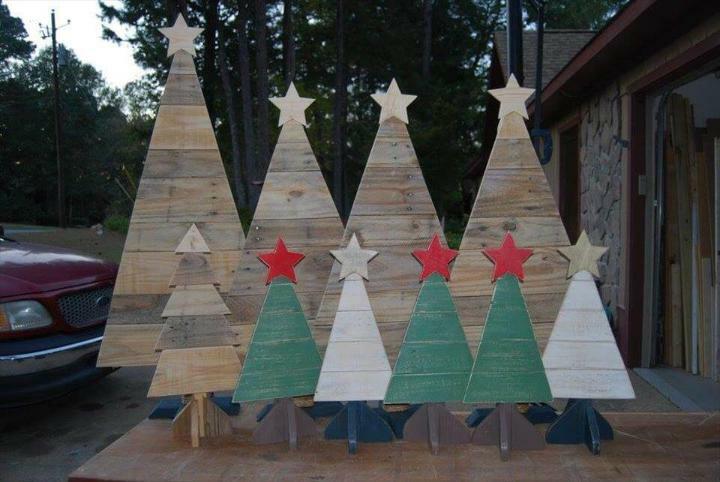 You can also give variations to your tree by changing the packing of pallet slats, you can pack the pallet lengths flat in a tight way for a solid look or can create a bit spacing among the planks for another great look! This bundle of trees have has been by flat packed installation of pallet slats! 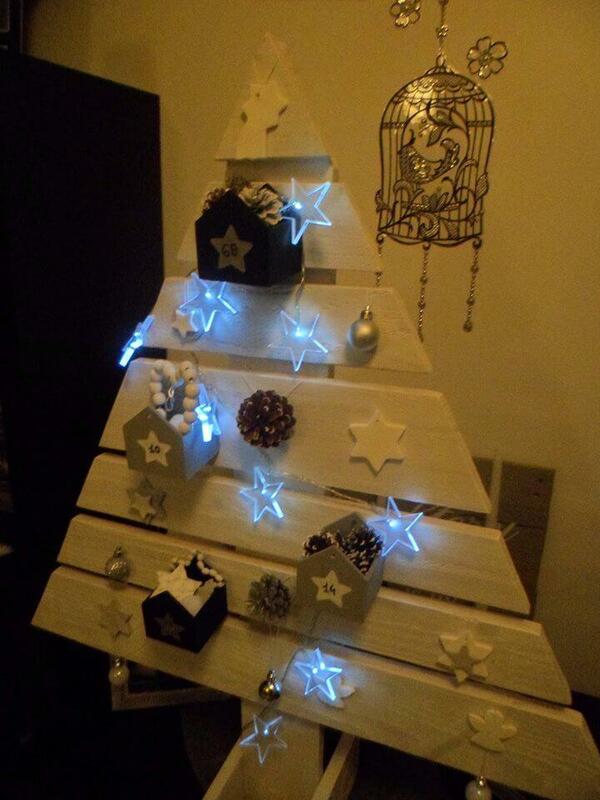 Each tree comes with a flat bottom and a a star top accent to captivate the all looking eyes! Just a choose a length and install a set of pallet planks that have a continual increase in sizes while going top to bottom side! Finally you will get a cone like shape that beautifully replicate a tree shape! A wooden block has been added to bottom to make the tree stand individually as a beauty station! 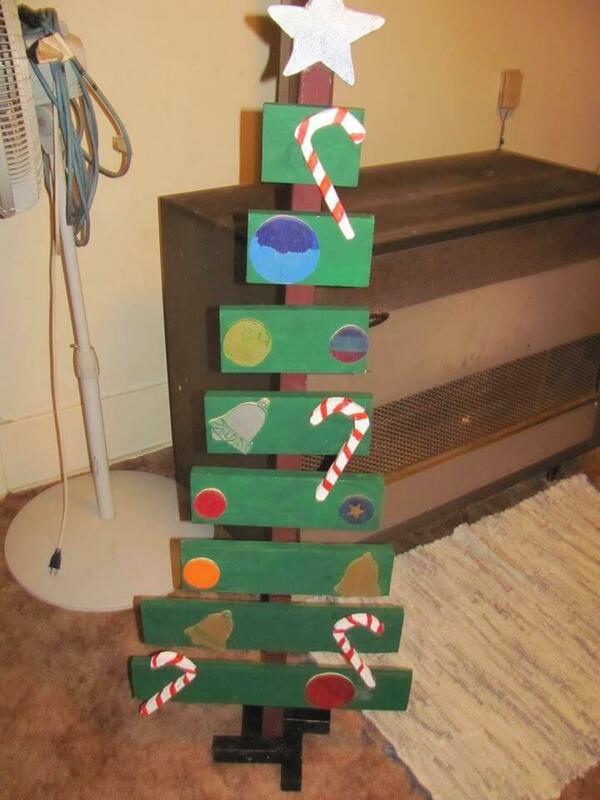 This one has been painted in green and comes on metal legs, some umbrella hooks has been mounted to fancy up the tree! Some colorful dots also jazz up the appearance and overall decor of the tree! In this design some extra pocket has been given to tree that can hold more decorative mass, this tree has been given a white theme and comes with a white painted look, white lighted stars and white baubles!